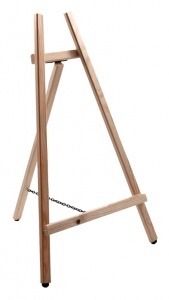 Attractive tabletop easel, great for displaying our chalkboards, whiteboards or menus, wine lists or any other information. The size of the mini easel is 28cm high and 21cm wide, and is suitable for A5 size chalkboard or an A4 chalkboard if displayed landscape. Small, 25cm x 40 cm, suitable for A4 or 30 x 40 cm chalkboards if displayed landscape. 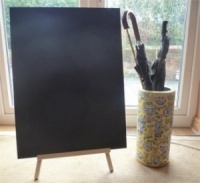 Medium, 35 x 50 cm, suitable for 30 x 40 cm or 40 x 60 cm chalkboards if displayed landscape. Large, 42 x 60 cm, suitable for 40 x 60cm or 60 x 80 cm chalkboards if displayed landscape. These were just what I was looking for. Beautifully made and they are going to look lovely at my daughters wedding display some pictures. This item was delivered quickly and when it arrived I was very happy with it. Nice and sturdy construction, just what I wanted! 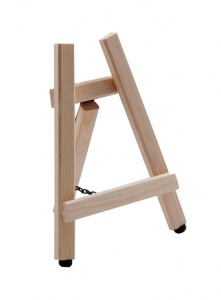 I ordered 2 medium easels to use at my wedding. They are sturdy & look great holding my table plan & photo frame. Great customer service - highly recommended.